Nine generations of the family lived in the lap of mountains. Like doting grandparents they watched over us, protected us from whatever was beyond and taught us lessons in silence. The sounds of our stories and songs echoed from the hollows and reverberated from the rocks and rills. We were at home there. On a certain August day in 1986 I loaded up my little Mazda GLC hatchback (fire engine red) and my grandparents loaded up their vehicle and we drove in tandem all the way from the home of my people to the gothic wilderness that was Duke University. This expansive and highly ornate campus would be the focus of the next three years of my life. The tall, straight pines that surrounded the campus hid the lack of mountains. But when you got away from the pines, the sky was so big it was hard to swallow. The mountains that once held it at a safe distance were gone. It felt strange and foreign. The city of Durham, North Carolina was going through a transition from a tobacco town to a new economy built on research, medicine, and technology. But in the afternoons the cigarette plants downtown would emit an aroma of processed tobacco that hung over the campus. It was a welcome smell for me as it reminded me of home. The tobacco field was the source of revenue for our farm, providing tax money to keep the property and paying bills and buying needed things so the operation could continue. As a Divinity School student I was set up to receive money from the Duke Endowment, funded by the Duke family’s cigarette industry. I had been raised on a tobacco farm and so it seemed just that I should receive a benefit from the hundreds of pounds of tobacco we had sold to companies like theirs over the years. 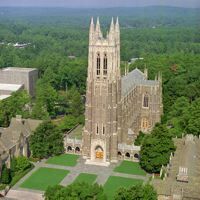 I contemplated those things when I stood in the majestic environs of Duke Chapel, a gothic structure on the center of the campus, erected according to the Duke family’s instructions, to be central focus of West Campus, its towering presence creating the point around which the cruciform campus was constructed. In the woods between the chapel and the student center I would trampse across a worn out dirt path that allowed me to cut straight from my parking spot to the Div School. I noticed a fellow there almost every day walking on a path that intersected mine, and he was very tall. He spoke every day. I was watching the Blue Devils play basketball before I noticed that the tall stranger who met me every day on the way to class was Alaa Abdelnaby. This Egyptian player went on to play in the NBA for a few years. I wondered how homesick he was as he traversed the dirt path to class. I found that path the most comfortable place on campus because it was real. I took a class that first semester after I arrived which proved to me I was getting “too big for my raisin’.” I enrolled in Moody Smith’s Greek Exegesis of the Gospel of John. I had seemed to develop a knack for Greek at Emory & Henry, so I thought I could breeze through this thing. The first day in class it became obvious I had made a miscalculation. We were a mixed crew. Most of the students were Ph. D. candidates. One fellow was a freshman from the university’s Trinity College. I was the only Master of Divinity student. We were expected to translate on sight whatever verse Dr Smith asked us to translate. His vocabulary was the best I had ever sat under. It was like listening to the Oxford English Dictionary as he spoke, using intentional words and phrases to describe the meaning of the Greek New Testament. His study of the gospel of John was extensive as well. It was not unlike opening a commentary and hearing it read itself. Somehow, in spite of my feeling like a minnow out of the creek, I finished that class. I didn’t try another like it. By my senior year in the M. Div. program, I had become so homesick I purchased a mandolin and listened intently to Doyle Lawson cassette tapes, and learned to pluck a little on that thing. I got with some other students who had Appalachian backgrounds and we put together an impromptu quartet. One played the guitar and the other two sang. We signed up for the day before Ash Wednesday to sing in chapel. We entered the place, excited about our chosen song, an old southern gospel, shaped-note, singing convention piece called “A Beautiful Life.” We realized we might have made a mistake when we found out the preacher for the day was Dr Geoffrey Wainwright, the British Methodist theologian whose primary contribution to the literature of theology was a work called Doxology which focused on knowing God through the regimented practices of the highest of high church worship. Boy, was he going to be surprised. We got up in front of the alb-robed divine, and adjusted our instruments, looked really hard at each other, and began plucking our strings. Immediately the temperature of the place warmed up. I had learned a few runs and my buddy on the guitar had a great skill on that instrument. We introduced the song musically and then began singing. William Golden’s song was ringing through the Divinity School chapel. The pipe organ was silent that moment but the strings of our instruments were sounding forth. Perhaps the fact that it was something really different or the fact it was almost mid terms, I’m not sure, but the student body were getting into it, even clapping along. I glanced over at my worship professor, a woman who ended up in northern Illinois somewhere. She looked extremely uncomfortable. I thought, “All right, sister, just hang on it’ll be over in a minute.” I was amazed by her self restraint when she had the opportunity to say something later in our refreshment time, but refrained. We had touched home that hour and that was all that mattered. Missing the mountains, I would sometimes drive north of Durham, go through the little towns of Oxford and Roxboro and find my way up across the Virginia state line until I crossed Highway 58 around South Boston. Just seeing the landscape of Virginia encouraged me. I’d go to the Hardees in South Boston, buy a Richmond Times-Dispatch (whose editor Alf Goodykoontz had attended Emory & Henry many years before), and drive back to the big city wilderness. I prayed that I wouldn’t die in that flat, foreign place, devoid of mountains. I listened to bluegrass and dreamed of home. Soon I would be returning. But that’s another post. This entry was posted in Uncategorized and tagged alaa abdelnaby, appalachia, Appalachian, chapel, cigarette plant, dirt path, Doyle Lawson, Duke, Duke Basketball, Duke Divinity, Duke family, Durham, family, gospel music, gothic, grandparents, guitar, home, mandolin, mountains, North Carolina, pines, shaped-note, singing convention, southern gospel, tobacco, Virginia. Bookmark the permalink. At the home of the said worship professor, I once heard Geoffrey Wainwright singing a folk song from Yorkshire. He no doubt understood the quartet’s faith and its expression. An elderly gentleman in our Church handed me an “old” hymnal (really it was ancient!!) that had the “shaped-notes”. I had never seen anything like this in my 50 some years. Guess which song he wanted my quartet to sing from this book? You guessed it ….. “A Beautiful Life”!!! After singing this song, it has become an old favorite.